Around 10am I returned to Universal, paid the $15 parking fee (again?!) and flipped over my worn park map for day 2: Universal Studios Florida. Continuing the movies and television theme of its adjacent park Islands of Adventure (previous post), which I visited yesterday, it inspires guests to "ride the movies," featuring six themed areas all situated around a large lagoon: Production Central, New York, San Francisco, World Expo, Woody Woodpecker's Kidzone and Hollywood, with each area offering a combination of rides, shows, attractions, character appearances, dining outlets and merchandise stores. 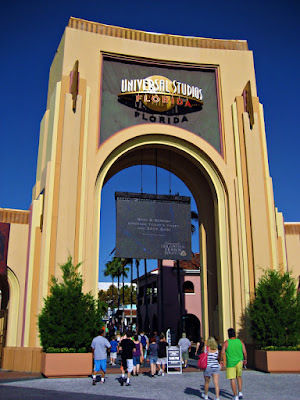 Unlike its sister facility, Universal Studios Hollywood, which is a working film and television studio that became a tourist attraction and theme park, Universal Studios Florida, opened in Orlando in 1990, was designed as both a theme park and a studio from the start. 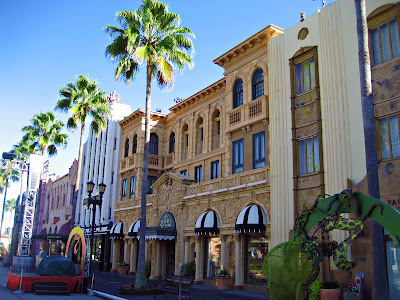 It was also the first time that Universal Studios had constructed an amusement park from the ground up. 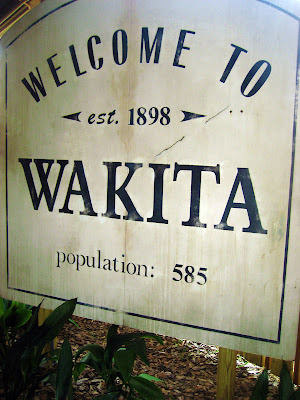 Evidently they've done a great job, hosting an estimated 5.9 million guests from around the globe in 2010, ranking it the eighth-most visited theme park in the United States. I entered through the iconic archway into the land of Universal, stopped at guest services for my free birthday souvenir pin (dork alert!) and a ticket to Universal's Halloween Horror Nights ($37 + tax) for tonight, then popped into the nearby Universal Studio Store and purchased a Meal Deal wristband for $21 + tax, which entitled me to unlimited food at select dining establishments throughout the park, which in a hungry stupor I thought would be a good value - WRONG! I found that it only grants access to the least desirable establishments serving the least desirable food (e.g. dessert is jello), and doesn't include shakes or drinks. Basically, it's their way of getting some business at places most people otherwise would not choose. I hung to the right, entering the Hollywood section, which greets guests with recreations of some of Hollywood's greatest landmarks, such as Schwab's Drug Store, Mel's Drive-In, and Rodeo Drive. Inside the lobby of the "Pantages Theatre" I found displays of real props and set pieces used in popular movies, including a raptor egg and claw from Jurassic Park, a dummy victim from Jaws, the Chucky doll from the Child's Play sequel, the knife and mask from Halloween II, and the prosthetic make-up from Ron Howard's How The Grinch Stole Christmas, which took 3 hours to apply, and felt so confining that Jim Carrey needed counseling from a Navy Seal who taught him torture resistance techniques! 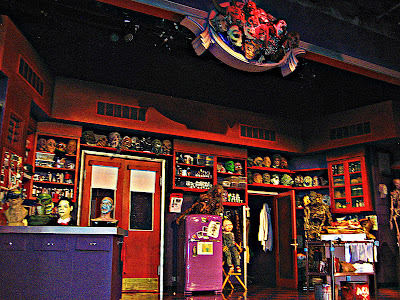 I and the rest of the crowd were shuffled from the lobby into the theatre for the live Horror Make-Up Show, described in the park map as "to discover the techniques used by top make-up artists to create amazing special effects from Universal's legacy of horror," which in actuality was a contrived fake-knife-in-chest intro, then a short montage of gory movie clips, followed by a couple of painfully annoying "funny guys" providing elementary insight and instruction you'd swear they stole from a Three Stooges routine. After 15 minutes of waiting for something to spark my interest, I couldn't justify staying 'til the end with so many better things to occupy my time, but I'm sure the people with kids found the show worthwhile. 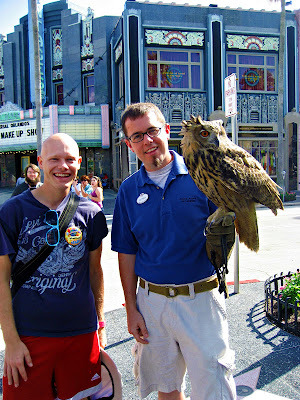 Me With the Harry Potter Owl! 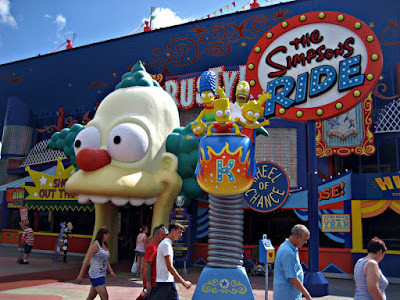 One of My Favorite Rides, Despite My Greatest Childhood Fear! How Much to Put One in My Backyard?! 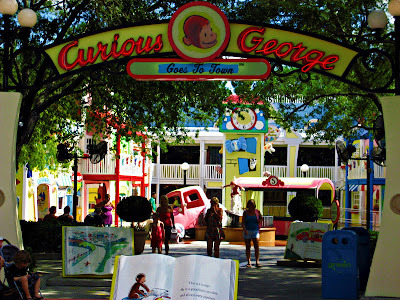 With my inner child at heart, I walked amongst cartoonish buildings of Curious George Goes to Town, an interactive play area featuring two large water troughs that dump 500 gallons of water on its streets every few minutes, and a ball area where guests can shoot soft, foam balls out of cannons. From the Eyes of Fievel! 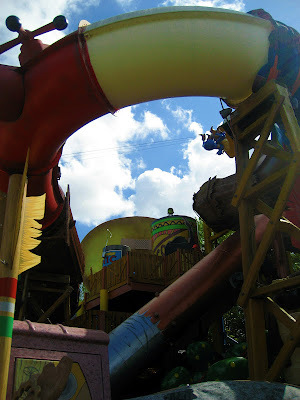 From the vantage point of a mouse, I strolled through Fievel's Playground, an area based on the films “An American Tail” and “An American Tail: Fievel Goes West,” with oversized props that include of a 1,000-gallon cowboy hat, a 30-foot spider web to climb, tin cans to crawl through, swaying bridges to cross, a giant cowboy boot to explore, and a twisting, turning 200-foot long water slide, woo-hoo! Upon entering the World Expo section of the park, which combines ultra-modern architecture from the 1960s with architecture from today (and includes various flags of countries of the world), I hopped onto The Simpsons Ride, I joined America's favorite animated family for a wild, over-the-top, 4 1/2-minute, motion-simulated adventure through Krustyland... flying, floating, and more or less crashing my way through it, thanks to state of the art technology that uses 80-foot IMAX screens, high-resolution digital projection, computer generated 3D animation, Dolby 6.1 surround sound, and over 2,500 LED lights - the largest number in theme park history! Hold on tight as the car jerks and jolts and drops with new hydraulics! I've been on this ride a few times now, at the Hollywood location, and it never gets old. 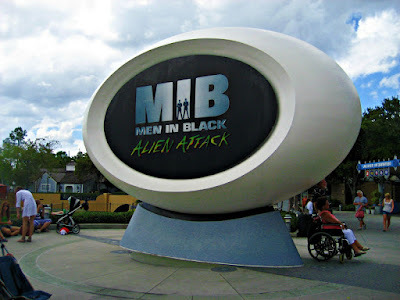 I joined the ranks of the Men In Black on Alien Attack, a spinning, laser-shooting, interactive dark ride adventure to save New York City from a recent alien invasion, all the while racking up points against another team of players on a separate vehicle, as you zap at 120 different alien species! The San Francisco section of the park has the distinct theme of a mature coastal city in Northern California. 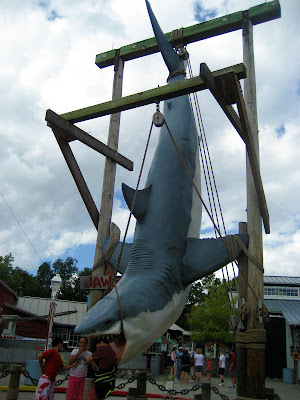 During my visit the area still connected to this section was themed to Amity, a seasonal New England tourist town from the Jaws franchise, but as of January 2012, this section has been permanently removed in order for construction to proceed on an up-coming attraction. On "Disaster! 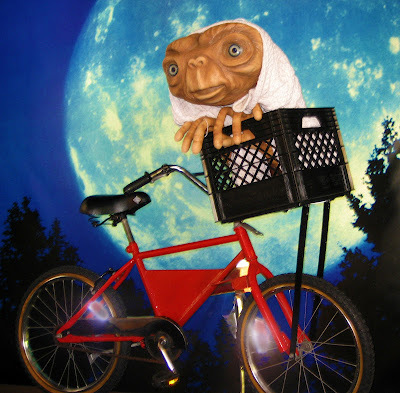 : A Major Motion Picture Ride...Starring You!" I was grouped together with a large number of other riders, then watched as seven riders were chosen as characters (the rest of us as extras) then we were all shuffled into an auditorium to watch a hologram-type projection of Christopher Walken, who tells us about the movie/ride that's about to commence, then we were shuffled into yet another auditorium/soundstage set, where the 7 previously selected people performed a series of seemingly random movements in conjunction with green screen technology, under the guidance of park staff. Then we all got onto a tram that entered an underground subway setting, where the train stops, the ground shakes, flames erupt, a tanker truck breaks through and the mayhem ends with a rush of floodwaters. 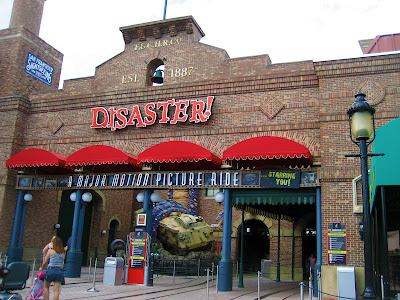 Lastly, thanks to high-speed editing techniques, we got to see our handiwork in the form of a 90-second disaster movie trailer that includes film sequences shot throughout the attraction's pre-show and main ride. Aww Cute, They Made a Friend! After some pizza 'n people watching al fresco at Louie's in New York, the section of park obviously modeled to recreate The Big Apple, I splurged on a $4 cup of seven layer coconut ice cream (and several samples, lol) from Ben & Jerry's across the street, then hit up Revenge of the Mummy (even though the film took place in London and Cairo, lol), a dark ride on an indoor roller coaster inspired by The Mummy film franchise. 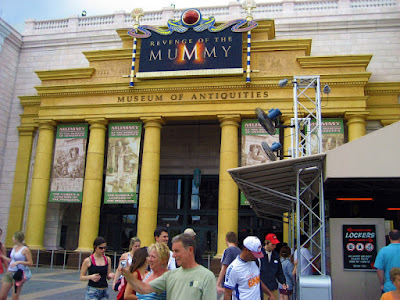 The combination of special effects, speed and surprises makes up for its relatively short duration, and is one of Universal’s most popular attractions, similar to the intense ride mechanics of Disneyland's Indiana Jones Adventure, featuring 80 degree banked turns, a 50 degree angle of descent, no inversions, and a top speed of 45 mph on its 2,200-foot (670 m) long track, dodging fireballs, swarms of scarab beetles and an army of warrior mummies, hooray! 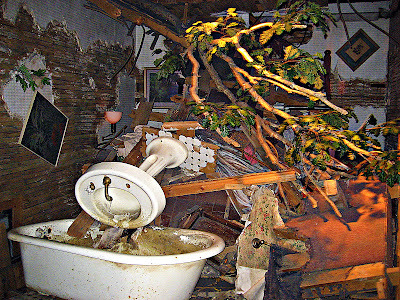 I found myself in the middle of an F5 tornado on Twister...Ride It Out, "a live-action attraction that uses special effects to put you in the center of a simulated tornado, on a sound stage mock-up of the "drive in" scene from the 1996 film, Twister. Slowly, the wind picks up, it begins to rain (you will get a little wet), and you grab onto the railing as things start getting very loud and intense. A voracious beast, you'll withstand the powerful winds (every minute of full force air during the show is enough air to fill more than four full-size blimps! ), deafening roar (the ear-piercing sound system runs at 110 decibels, as loud as a rock concert!) and pulse-pounding intensity of a monster storm that consumes everything in its path, shattering windows, hurling trucks, and crushing enormous signs in a total assault on your senses – with you right in the middle." AWESOME! I unknowingly saved THE BEST RIDE for last, with Hollywood Rip Ride Rockit, a radically innovative attraction where adrenaline, music and technology meet, with first-ever maneuvers, cutting-edge technology, rider-selected songs that span across five genres of music, and the option of a personalized take-home music video (for purchase). The experience: Step onto the country’s only people-mover-style conveyer belt, allowing vehicles continuous motion to leave the loading platform every 23 seconds, and slide into the bucket seat of the specially designed X-CAR, outfitted with Polk Audio marine-grade stereo speakers that can push out 165 watts and featuring stadium-style seating so that everyone has an unobstructed view. There is no need to pull down an over-head restraint system like other modern steel coasters, just a padded lap bar allowing for unprecedented freedom of movement (scary!). Customize your experience using the personal touchpad mounted on your vehicle, selecting your favorite song from a list of 30, spanning 5 genres, from legendary talent like the Black Eyed Peas, No Doubt, Kanye West, Evanescence, and Donna Summer, then prepare to climb 167 feet straight up, before dropping 17 stories and hurdling through the air at 65 mph with 6 near-miss moments and three first-ever maneuvers: a non-inverting loop, bursting through a building facade, and a spiraling, negative-gravity move, all while rocking out to 90 decibels of music, yet never hearing the songs playing for other riders! A video that mixes ride footage, music and special effects is available for purchase at the kiosk as soon as riders get off the roller coaster, available in DVD and email-able formats. 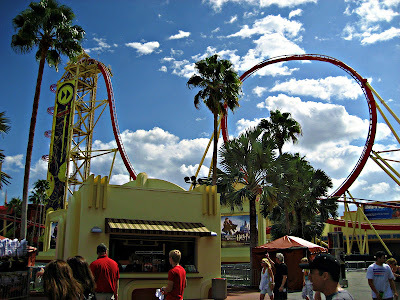 This coaster was AMAZING; I rode it at least 3 times, listening to Paralyzer, Born to be Wild, and Pump It! 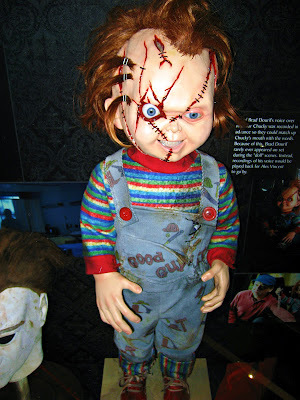 Lastly, before experiencing Universal's "Halloween Horror Nights 21" (next post), I experienced Shrek 4-D, where along with a long line of others, I received a pair of "OrgreVision" 3-D Goggles and stepped into a dungeon-themed pre-show room with the Three Little Pigs, Gingy, and Pinocchio, who were hanging captured. 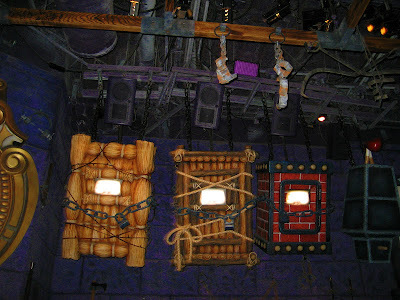 Two giant television monitors on either side laid the groundwork, then the cinema doors opened and the audience took their seats, where with the glasses and special effects we were able to see, hear, and actually FEEL the action as moving seats, water, wind, mist and other special effects put us right in the middle of the 16-minute fairytale adventure, where along with Shrek and Donkey, we galloped through a haunted forest, rode on the back of a fire-breathing dragon, and plunged over a churning waterfall to save the day! 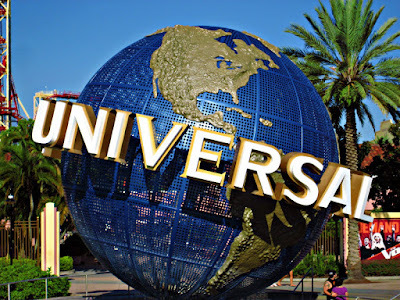 Oh man, Universal was my favorite, but it's changed so much since I last went there. I can't believe they got ride of the Jaws ride. That was my fav!! When are they gonna make a Death Becomes Her ride??? 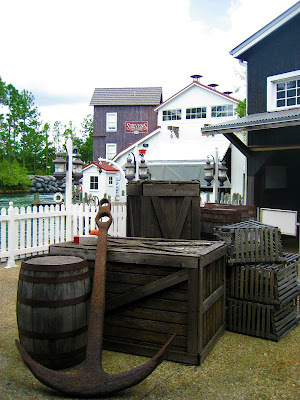 Maybe that's the upcoming attraction they're making way for - fingers crossed, lol! They could have guests swerve dangerously close to the edge of "Mulholland Drive," making it look like we've had just a LITTLE too much to drink, then wedge our foot on the accelerator and send us on our way! Ugh, we'd be SO happy! 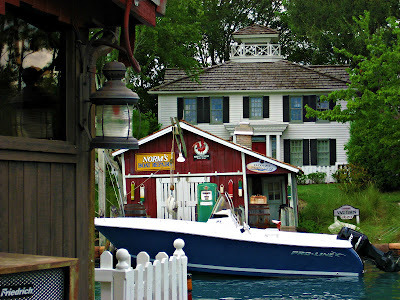 And it can be a water ride, and then when it's over you can say, "Look at me, Ernest! Just look at me! I'm soaking wet!"